Do-It specializes in providing effective retail solutions, and our wobblers and merchandising display strips are two great examples. 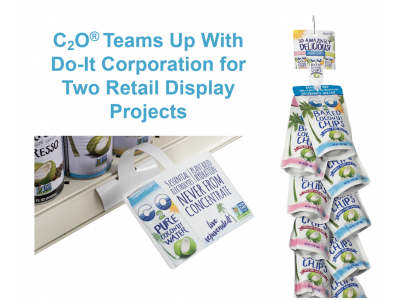 Using two different products was a great way for C2O to increase their visibility and their sales. Easy to install, easy to see. Wobblers make an impact because they’re bright, colorful, and have a gentle swaying motion to attract attention in the shopping isle. C2O chose our PWB wobbler that can either be snapped into the shelf channel or applied with the adhesive sticker on the back. The digital printing on the wobbler was bright, colorful, and effective with corporate colors. The wobbler featured a product photo and a quick sales pitch. Other clients have added special offers or suggested pairings. Whichever approach, the wobbler is a great way to increase brand awareness and get your message in front of shoppers. Display anywhere and everywhere. One of the greatest advantages of the merchandising display strips is that they’re so easy to hang anywhere an s-hook can be used. Coupled with a digitally printed header, you’ve now got a mobile display that can be placed in multiple locations simultaneously to suggest pairings and encourage impulse buying. C2O chose the MLQ printed header and the 2-80 display strip which has a recommended weight per hang position of 3 oz. The MLQ display header adheres to the merchandising strip for another opportunity to get your branding in front of the customer. Utilizing multiple display techniques gets your product off the shelf and into view of your customers. If you’d like to see these displays in action, and learn more about these two different solutions, watch our C2O Video Case Study. If you like to explore options for retail display of your products, contact us today.